The Alaska Marine Highway System (AMHS) announced today that Ketchikan-based Alaska Ship and Drydock (ASD) has been contracted to design the Alaska Class Ferry. The Alaska Class Ferry project will modernize our state’s ferry system, serving shorter routes and allowing our fleet’s larger vessels to run longer distances. I’m pleased an Alaska company has been contracted to design the new ferry. ASD operates the Ketchikan Shipyard in partnership with the Alaska Industrial Development Authority (AIDEA). The contract will give the Ketchikan Shipyard first option to bid on constructing the vessel. This would be the first state ferry built in Alaska, and a major achievement for our state’s ship-building industry. I thank the Governor and the Department of Transportation & Public Facilities for their decision, and for helping bolster a major industry for coastal Alaska. The Legislature worked with the Administration to secure $120 million for to construct the first Alaska Class Ferry. I will continue working with colleagues and the Governor to set aside funding for new vessels to make Alaska’s marine transportation system more efficient. The Alaska State Legislature adjourned early this morning, marking an end to a productive legislative session. I applaud my colleagues and the accomplishments made this session. I am proud of the progress made this year toward addressing a range of energy, education, public health and safety, and transportation needs in Southeast Alaska as well as the rest of the state. This year the Senate continued its goal of ensuring state government saves before it spends. The Senate took the lead by setting aside $3.1 billion in savings in the Operating Budget, including $50 million for the Alaska Marine Highway System Vessel Replacement Fund, helping advance modernization of Alaska’s ferry system. The budget strikes a good balance between building our economy and meeting community needs through capital projects and keeping state spending in check. You can see a full list of the FY13 capital projects for senate district A, which I represent, here. The Legislature also appropriated $50 million in assistance to school districts and $46 million in community revenue sharing to help address the high costs of energy and heating oil. Throughout the session, the Senate led a thorough, detailed review of Alaska’s oil and gas tax fiscal system. The Senate’s work progressed the public debate on this issue and sets the stage for making reasoned changes to the state’s oil tax regime. 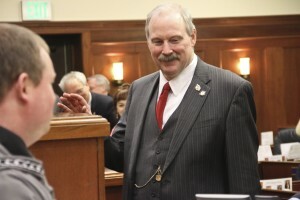 As a member of the Senate Resources Committee and as Co-Chair of the Senate Finance Committee, I worked to engage state agencies, oil companies, and oil and gas tax consultants in an effort to make Alaska’s fiscal regime more competitive while safeguarding state revenues. Senate Bill 130 – Establishes a state council to preserve Alaska Native languages. House Bill 121 – Creates new loan funds for small businesses, mariculture, commercial charter fisheries and community quota entities. House Bill 60 – Expands geoduck farming. House Bill 246 – Names a bridge in Petersburg after fallen Vietnam Marine, Harry Kito. House Bill 261 – Enhances the commercial Fishing Revolving Loan Fund. House Bill 250 – Reauthorizes the Renewable Energy Fund grant program until 2018. House Concurrent Resolution 18 –Facilitates young Alaskans starting commercial fisheries careers. House Joint Resolution 20 – Opposes the “roadless rule” in the Tongass and Chugach National Forests. Today the legislature passed legislation naming a Petersburg bridge in honor of Donald “Harry” Kito. Harry was a resident of Petersburg who gave his life while serving in the Marine Corps during the Vietnam War. Growing up in Petersburg, he joined the Marines 1965 and was deployed to Vietnam the following year. Harry was killed in action July 8, 1967 at the age of 25 and is buried at the Petersburg Memorial Cemetery. I lived in Petersburg at the time of Harry’s passing, and clearly remember the day that his body was delivered home with military honors. The experience was very impactful in the small community; the entire town shut down in order to attend the funeral and mourn the loss of this young man. It’s important to recognize Alaskans who give of themselves to make a difference in our state and country, and I’m pleased the legislature passed legislation honoring Harry’s sacrifice for our country. Having quality Alaskans involved in government is crucial for our state. I am glad the Governor re-appointed these individuals and appreciate their service to Alaska. Today, the Senate unanimously passed the state’s fiscal year 2013 Capital Budget, Senate Bill 160. The budget appropriates $2.63 billion, including $1.8 billion in state funds and $830 million in federal funds. The bill is one of the most important documents considered by the Legislature, and in my role as Co-Chair of the Senate Finance Committee, I am responsible for presiding over the Senate’s work on the Capital Budget. The Senate struck a balance between building our economy and keeping state spending in check. Five vital issues were addressed in this year’s Capital and Operating Budgets: Savings, Transportation, Energy, Education and Health Care. The Senate worked closely with Governor Sean Parnell and House Leadership to ensure that spending goals were met. In the FY2013 Capital Budget, the Senate appropriated an estimated $710 million for transportation projects, $340 million to improve schools and education across the state, $190 million for projects to reduce energy costs statewide, and $70 million to improve health care in our state. For highlights of selected projects, click on the fact sheet here. The Capital Budget now heads to the House for consideration.